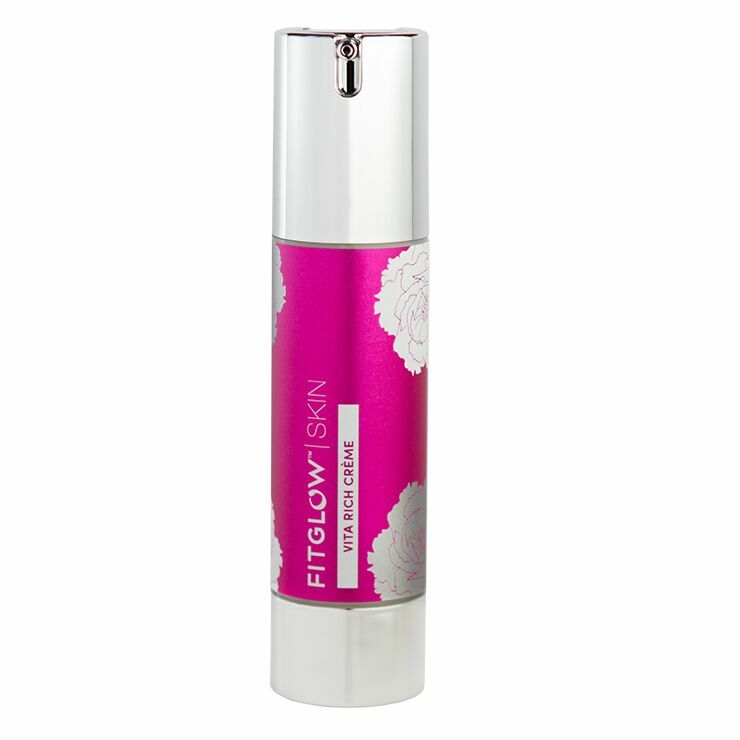 Give skin a look of youthful good health with Fitglow Beauty Vita Rich Crème. Rare Grass Extract makes skin feel nourished and plumped, while phytonutrients, vitamins, and cherry extract brighten the appearance. Daily use of this vegan face creme improves the look of elasticity, smoothed texture, and evened tone. Massage onto face, neck, and décolleté for a smooth, youthful appearance. May be used on clean skin or over serum. Aloe Barbadensis Leaf Juice (Aloe Vera)*, Cassia Angustifolia Seed Polysaccharide (Botanical Hyaluronic Acid ), Cetearyl Olivate, Sorbitan Olivate (Olive Source), Simmondsia Chinensis ( Jojoba Oil)*, Rosa Canina (Rose Hip Oil), Borago Officinalis (Borage Oil), Argania Spinosa (Argan Oil), Coenzyme Q10 Leucidal Aloe (Aloe Plant Preservative), Imperata Cylindrica Extract (Congon Grass), Retinol Liposome, Acerola Bioferment (Cherry) Rubus Idaeus Extract (Raspberry )**. Prunus Domestica Fruit Extract (Plum)*.